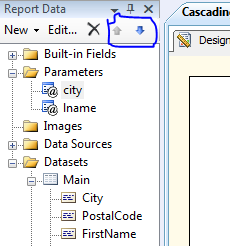 In SSRS 2005 it was relatively easy to change the order of the parameters, just right mouse click on the report and click on Report Parameters. But they “moved the cheese”. Once you know where it is, it is fast to change. It is now in the Report Data tab. Click on the parameter to move. Up/Down arrows then become highlighted. You can then use those arrows to change the parameter order.